The prevalence and incidence of heart failure (HF) is increasing worldwide,,,,, and despite many advances in diagnosis and management, HF remains more malignant than many types of cancer. Numerous patients experience a rapid recurrence of symptoms and frequent hospitalization despite optimal medical and device therapies. This group of patients represents the most advanced stage of HF with poor prognosis and should be considered for specialized treatment strategies such as mechanical circulatory support (MCS) devices and heart transplantation (HTx). Various clinical and paraclinical variables and scoring systems were defined to predict prognosis and select a proper candidate for HTx and MCS. Although performing invasive hemodynamic assessment is not forced by guidelines on all HF patients, it is utilized on selected patients to assess the hemodynamic effect of treatments and to evaluate patients before HTx. Moreover, we always encounter restriction in donor numbers, so there is always a need to prioritize patients for HTx. Cardiac index (CI), pulmonary arterial pressure (PAP), and pulmonary capillary wedge pressure (PCWP), right-sided filling pressures, and other parameters are measured in right heart catheterization (RHC) and provide us with worthy information., Measuring all the above parameters is of great importance in candidacy evaluation for MCS or HTx. Many studies were conducted comparing the accuracy and usefulness of these hemodynamic parameters in predicting prognosis and clinical course of patients. At low cardiac outputs, tissues extract a greater amount of oxygen, and the mixed venous saturation is low. Hence, low mixed venous saturation (as an indicator of low CI) and high right- and left-sided filling pressures are red flags that warn imminent deterioration of patient. Right atrial pressure (RAP) is a sensitive indicator of a failing right ventricular (RV), but its measurement is influenced by some factors such as tricuspid regurgitation wave and fasting state of the patient before catheterization. In this study, we aimed to assess the capability of various hemodynamic parameters (particularly cSVO2) in predicting time to clinical worsening and adverse events. We enrolled eighty consecutive patients with symptomatic severe systolic HF according to the following inclusion/exclusion criteria. 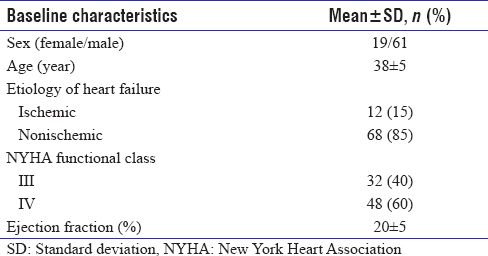 Inclusion criteria included 15- to 60-year-old individuals with symptomatic severe systolic HF (left ventricular ejection fraction [LVEF] <30%) and New York Heart Association Functional Class (NYHA-FC) III or IV on optimal guideline-directed HF medications who were candidate for transplantation or MCS. The exclusion criteria comprised of complex congenital heart disease and history of valve replacement. The study was approved by the Ethics Committee of Shaheed Rajaei Cardiovascular, Medical and Research Center. Informed consent was obtained from all patients. For all patients, RHC was performed under fluoroscopy guiding using the Edwards' LifeSciences Swan-Ganz catheter More Detailss. Pulmonary artery catheter was inserted through subclavian or internal jugular vein. All values were averaged in three consecutive beats at end expiration. 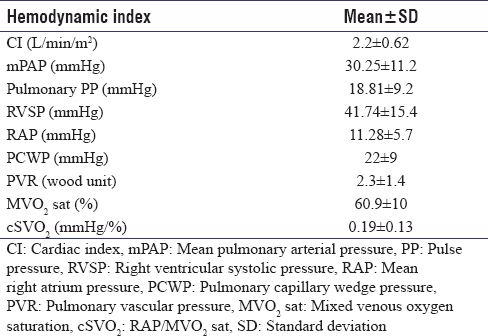 CI by Fick method, PCWP, pulmonary artery pressure (PAP), pulmonary vascular resistance (PVR), systemic vascular resistance, pulmonary pulse pressure, RAP, RV systolic pressure (RVSP), and mixed venous oxygen saturation (VO2 sat) were measured. cSVO2 was also measured as RAP/SVO2. We hypothesized that cSVO2 could be more sensitive to predict prognosis and time to clinical worsening than RAP. Patients were followed for a period of 18 months. NYHA-FC, hospitalization, time to clinical worsening, and mortality were recorded in regular periods. We also asked patients who missed a visit for reason (hospitalization, emergency visit, or probable patient death). Time to clinical worsening was defined as a period of time free from worsening functional class and all-cause hospitalization and any need to emergency department visits. Statistical analysis was performed using SPSS version 22 for Windows (SPSS Inc., Chicago, IL, USA). Quantitative data were expressed as a mean ± standard deviation and qualitative data as numbers (%). All variables were tested for normal distribution with Kolmogorov–Smirnov test. Kruskal–Wallis test was used to assess the relationship between hemodynamic index and ordinal variable. Spearman's rho test was used to identify the correlation of the hemodynamic parameters and time to clinical worsening. P < 0.05 was considered statistically significant. [Table 1] shows the baseline characteristics of our study population. Eighty patients, including 61 (76.3%) men and 19 (23.8%) women of mean age 38 ± 5 years, were followed for 18 months in the regular period. [Table 2] depicts hemodynamic parameters at RHC. Thirteen (16.3%) patients died with cardiac cause (one by sudden cardiac death and the others by decompensated HF). Significant association was found between mortality and CI (P = 0.01), RAP (P < 0.001), cSVO2 (P < 0.001), mean PAP (mPAP) (P < 0.001), PCWP (P < 0.001), and RVSP (P = 0.02) [Table 3]. Seven (8.8%) patients underwent HTx despite optimal medical and device therapies. Significant relevance was seen between CI (P = 0.01), RAP (P = 0.004), cSVO2 (P = 0.002), and HTx. 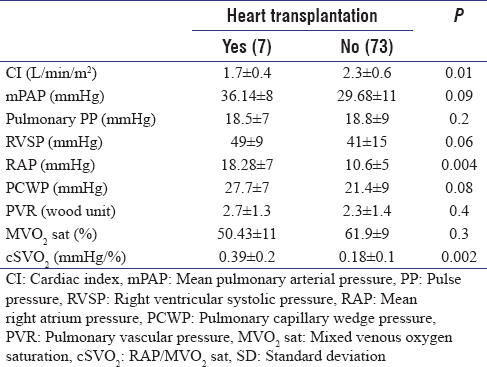 RVSP and mPAP were higher in these patients but not statistically significant [Table 4]. During follow-up, 36 (45%) patients were admitted to the hospital with HF decompensation, 15% occurring in the 1st month. 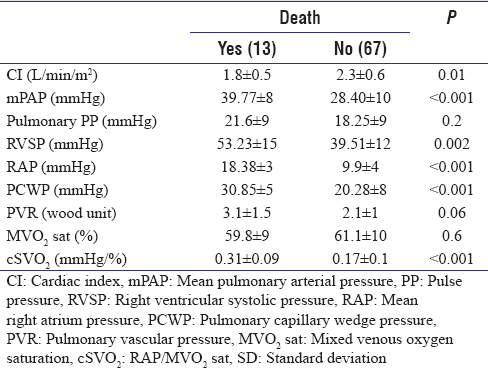 Assessing hemodynamic parameters in this group of patients showed higher RVSP, mPAP, PCWP, RAP, and cSVO2 (P < 0.01). 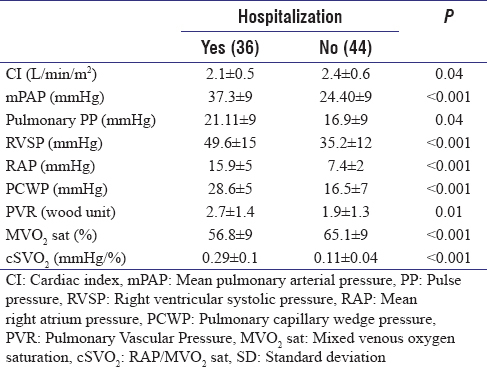 Remarkably, patients with more frequent hospitalization and those hospitalized shortly after discharge (during 1st month) had significantly higher RAP, cSVO2, and RVSP (P < 0.001) [Table 5] and [Table 6]. Time to clinical worsening was significantly shorter for patients with higher PCWP (P < 0.001), RAP (P < 0.001), and cSVO2 (P < 0.001). Defining prognosis in HF is complex and of paramount importance. Clinical signs and symptoms, cardiac enzymes, imaging data, and hemodynamic parameters should be used for assessing patient outcome and guiding treatment. According to guidelines, invasive hemodynamic assessment should be done when there is discrepancy between symptoms and noninvasive testing results and guiding treatment strategies or evaluation of patients before MCS or HTx., Moreover, constraints in donor number made us prioritize our patients for heart transplant more. CI, PCWP, mPAP, and RAP are important parameters in predicting outcome., Nohria et al. showed CI and PCWP as independent predictors of mortality and urgent transplantation. Dupont et al. 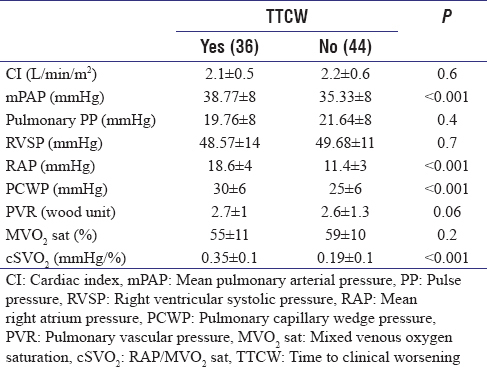 showed that lower PAC (ratio of stroke volume over pulmonary pulse pressure) and higher PVR and PCWP are related to more adverse clinical events (all-cause mortality and cardiac transplantation). In accordance to previous studies, a significant association was seen between CI, PCWP, RVSP, PAP, and PVR, and adverse clinical outcome (mortality, cardiac transplantation, and time to clinical worsening) was seen. Studies have shown that prognosis and clinical course of patients with HF are not solely determined by LVEF. RV function and right-sided filling pressures are important contributors as well. As mentioned before, RAP is a sensitive indicator of a failing RV. In our study, patients with more frequent hospitalization and those hospitalized shortly after discharge (during 1st month) had significantly higher RAP. Low mixed venous saturation as an indicator of low Cardiac Output(CO) is another predictor of clinical worsening. By merging RAP and mixed venous saturation, we defined the cSVO2 index. cSVO2 had a strong correlation with time to clinical worsening, hospitalization, and mortality. This index is a stronger predictor of time to clinical worsening than other parameters. These findings show that in patients with advanced HF, the prognosis is strongly related to right-sided pressures which was revealed in our study by higher RAP, cSVO2, and lower MVO2 saturation. Our study has some limitations; it was a single-centered study enrolling eighty patients with HF. Furthermore, as a result of economic issues, we have restrictions in utilizing MCS, and this can affect our patients' survival and clinical course. Risk stratification in patients with advanced HF is of great importance. We showed that, in the present study, the right-sided hemodynamic parameters including RAP and cSVO2 are important predictors of clinical worsening and time to event in this group of patients. Park SJ, Tector A, Piccioni W, Raines E, Gelijns A, Moskowitz A, et al. Left ventricular assist devices as destination therapy: A new look at survival. J Thorac Cardiovasc Surg 2005;129:9-17. Kirklin JK, Naftel DC, Kormos RL, Stevenson LW, Pagani FD, Miller MA, et al. Fifth INTERMACS annual report: Risk factor analysis from more than 6,000 mechanical circulatory support patients. J Heart Lung Transplant 2013;32:141-56. Lietz K, Long JW, Kfoury AG, Slaughter MS, Silver MA, Milano CA, et al. Outcomes of left ventricular assist device implantation as destination therapy in the post-REMATCH era: Implications for patient selection. Circulation 2007;116:497-505. Askoxylakis V, Thieke C, Pleger ST, Most P, Tanner J, Lindel K, et al. Long-term survival of cancer patients compared to heart failure and stroke: A systematic review. BMC Cancer 2010;10:105. Mehra MR, Kobashigawa J, Starling R, Russell S, Uber PA, Parameshwar J, et al. Listing criteria for heart transplantation: International society for heart and lung transplantation guidelines for the care of cardiac transplant candidates--2006. J Heart Lung Transplant 2006;25:1024-42. Levy WC, Mozaffarian D, Linker DT, Sutradhar SC, Anker SD, Cropp AB, et al. The Seattle heart failure model: Prediction of survival in heart failure. Circulation 2006;113:1424-33. Palardy M, Stevenson LW, Tasissa G, Hamilton MA, Bourge RC, Disalvo TG, et al. Reduction in mitral regurgitation during therapy guided by measured filling pressures in the ESCAPE trial. Circ Heart Fail 2009;2:181-8. Nohria A, Tsang SW, Fang JC, Lewis EF, Jarcho JA, Mudge GH, et al. Clinical assessment identifies hemodynamic profiles that predict outcomes in patients admitted with heart failure. J Am Coll Cardiol 2003;41:1797-804. Dupont M, Mullens W, Skouri HN, Abrahams Z, Wu Y, Taylor DO, et al. Prognostic role of pulmonary arterial capacitance in advanced heart failure. Circ Heart Fail 2012;5:778-85.